There is a change in the air, and for Gulf Coast Humane Society’s biggest fundraiser it comes as a refreshing one. After eight successful years of hosting the gala-style ‘A Home for the Holidays’, there will be many different aspects to GCHS’ biggest fundraiser of the year, from the theme to the date and also to the location. We want to keep this fundraiser which sustains GCHS throughout the year fresh, but the ultimate goal remains the same, and that’s to provide for the shelter animals. No longer will the night feature a gala formal dress-up theme, instead it will be a more casual and relaxed atmosphere, highlighted by Fort Myers area chefs cooking some of their best creations. The night of entertainment will be entitled “Celebrity Chef Festival” and be moved from early November to Thursday, January 17, from 5:30-9pm. The location is another exciting change with the event being moved to Six Bends. They are pet friendly and will provide an entertaining venue for our Celebrity Chef Festival debut. The evening will include Hors D’oeuvres, dinner, open bar, live/silent auction, live music and adorable pets. The food will be prepared by 8-10 local chefs at stations that can be sampled throughout the evening. The sponsorship packages will remain similar to ‘A Home for the Holidays’ and are just as important. Frequently referred to as Florida’s Favorite Fundraising Auctioneer, Scott Robertson is a full time professional benefit auctioneer. For more than 20 years, he has assisted schools and non-profit organizations to meet or exceed their fundraising goals. 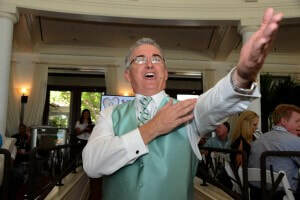 This Florida State Champion Auctioneer has conducted thousands of fundraising auctions. In the past six year Scott and his associate auctioneer, Sara Rose Bytnar, helped not for profit organizations raise more than $150 million dollars. ​In 2014, Brandon formed his own jazz/neo-soul/pop band called "Jazz Copeland". The band in it's two year span had great success performing for various festivals and venues around Florida. In 2015, Brandon performed at the world famous Dizzy's Coca Cola Club in New York City with the nationally recognized FSU Jazz Sextet joining members of the JALC Orchestra. The Fall of 2015, he was honored with the opportunity to perform with the legendary Count Basie Orchestra on a few shows. Brandon has performed in the South Carolina Jazz Festival, Atlanta Jazz Festival, Savannah Jazz Festival, Clearwater Jazz Festival, Sanibel Jazz & Blues Festival, The Landings Music Festival, Florida Jazz & Blues Festival, and In May of 2017, Brandon made his debut as a Headlining Act at the 2017 International Jacksonville Jazz Festival in Jacksonville. Brandon has performed with notable acts such as World Famous Count Basie Orchestra led by director Scotty Barnhart, Vocalist Carmen Bradford (Singer for The Count Basie Orchestra), Jason Marsalis (NEA Jazz Master, Drummer & Vibraphonist), Marcus Roberts (Jazz Pianist), Marty Morell (Drummer of Pianist Bill Evans: 1968-1974), Vocalist Carla Cook (Grammy Nominee NYC Singer), Dan Miller (Former Member of The Harry Connick Jr. Big Band) , Lew Del Gatto (Former Member of the SNL Band), Leroy Jones (Jazz Trumpeter, New Orleans Legend), Harry Watters (Trombonist, Jupiter Endorsed Artist), Charlie McCoy (International Harmonica Player, Country Hall of Fame), Ray Coussins (Pianist and Former Accompanist for Frank Sinatra), Eric Alexander, Wycliffe Gordon, Greg Tardy, Marcus Printup (Member of the JALC Orchestra), Nick Finzer, Patricia Dean, Thomas Heflin, Leon Anderson, International Jazz Singers June Garber & Halie Loren, Zach Bartholomew (International Jazz Pianist), Gerald Watkins (Member of the Ellis Marsalis Quartet), Robert Boone (Drummer for the Count Basie Orchestra), Ray "Quasi" Nelson (Drummer for Pop Singer Khelani and former drummer for the Count Basie Orchestra), and Adrian Crutchfield (Former Saxophonist for Prince). ​Currently, Brandon is the Director of Jazz Studies & Director of the FGCU Basketball Band at Florida Gulf Coast University in Fort Myers, FL. He is now an honorary member of the Kappa Kappa Psi Mu Upsilon Chapter at Florida Gulf Coast University. Brandon was nominated most recently for an EMMY® Award for best documentary for educational collegiate programs featuring the FGCU Jazz Ensemble. We sincerely hope that you feel these changes will be refreshing and fun and become part of Celebrity Chef Festival 2019!